The Las Vegas Sands Corporation (LVSC) embarked on a World audit to identify and engage a single organisation capable of designing, developing and deploying a state-of-the-art outdoor permanent multimedia attraction on the doorstep of Asia’s premier Integrated Resort – Marina Bay Sands. After a 12 month audit, Laservision was selected as the successful company to produce a show unique in scale and dramatic concept. The Light and Water Show would captivate audiences using music, theatrical lighting, water effects, pyrotechnics, fountains and choreographed special effects synchronised into a single spectacular nightly performance. ‘Wonder Full’ is the story of Water and Light creating Life, told with Water and Light. 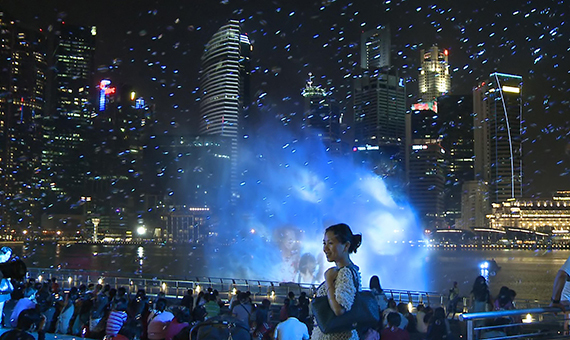 The spectacular explores humanity and the beauty of the human experience through original footage of the people of Singapore, an original sound score and an abundance of technologies spanning the 15.4 hectare (38 acre) Marina Bay Sands site. The show takes you on an emotional and heartfelt journey through the use of water, fire, light, laser and other high impact Mega Media elements. 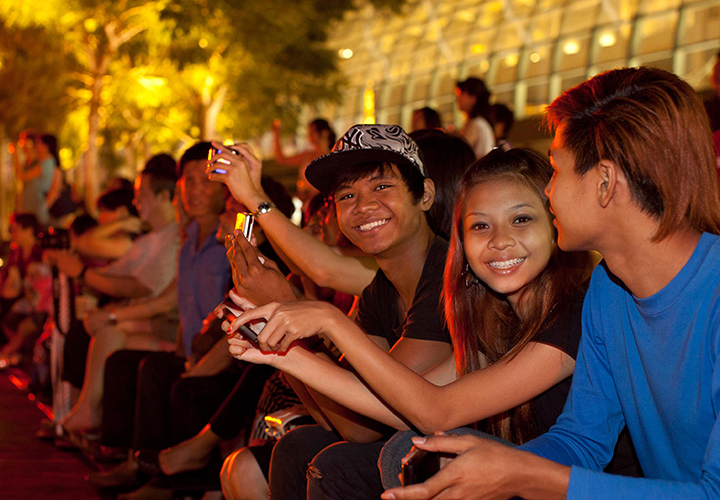 The show features motion pictures and music produced in Singapore with heavy local influence. ‘Wonder Full’ celebrates local Singaporean talent showcasing the best of Singapore musicians across two generations. Laservision engaged Mr Iskandar Ismail, an internationally renowned Musician, Composer, Producer, Music Arranger, Director, Conductor and Orchestra Conductor to create an original sound score. Mr Ismail was the Musical Arranger and Conductor for the 15th Asian Games Opening Show in Doha (2006) and the Music Producer, Composer and Director for the Inaugural Youth Olympic Games Opening and Closing Ceremony Shows (2010). Mr Daryl Ang was selected as the Maestro and Conductor for this prestigious project. Maestro Ang was born in Singapore and has been appointed the ‘Young Associate Conductor’ for The Singapore Symphony Orchestra. Currently based in Europe, a selection of his accomplishments includes the winner of the 50th Besançon International Young Conductor’s Competition in 2007, the ‘9th Antonio Pedrotti International Competition for Conductors’ in Trento-Italy in 2006, and the ‘Arturo Toscanini Competition’, 2008. The original soundtrack was recorded on location in Bratislava by the 140 strong Bratislava Symphony Orchestra including 10 sopranos, 10 altos, 8 tenors and 8 basses. Also featured in the soundtrack is child violin prodigy, Gabriel NG. He came to National prominence in 2003, when he won Singapore’s National Piano and Violin Competition when he was just nine years old. ‘What a Wonderful World’ by Louis Armstrong, is an immediately recognisable work that has delighted millions of people throughout the world for many years. As part of this original soundtrack a rendition of this song was included performed by the Bratislava orchestra and two famous Singaporean singers Mr Joakim Gomez (19 year old Singapore Idol finalist) and Ms Amni Musfirah (16 year old trained at the Singapore School of Arts, and performed the soloist ballad rendition of the Asian Youth Olympic Games 2010 hosted by Singapore). A global team consisting of 100 specialists in architectural, design, creative, musical, engineering, technical and IT resources were drawn through Laservision’s Hong Kong, Australia and Singapore offices. All technologies are controlled down to the millisecond by Laservision’s Digital~Data Pump Series III via 20 Media Servers and over 50 kilometres of data cable and fibre optics. Elegant custom designed musical fountain spanning the waterfront event plaza with 18 individually controlled fountains reaching up to 20 metres in height, in conjunction with independent tilt mechanisms allow for a wide range of stunning liquid patterns. The fountains are illuminated by submerged high powered multi-coloured custom LED technology. Three enormous Water~Screens creating majestic liquid walls spanning about 2,000 square metres (1/2 an acre). A total of half a million watts of light including: 30 high powered multi-coloured moving searchlights located on the waterfront Event Plaza, Skypark and ArtScience Museum Oculus; one billion foot candles of light arising from the Oculus of the ArtScience Museum into the heavens; six high powered Stella~Ray and Light~Ray Laser Systems producing over 300,000 milliwatts of laser energy capable of being seen for up to 55 kilometres outdoors; and over 250,000 energy efficient intelligent Light Emitting Diodes (LEDs). 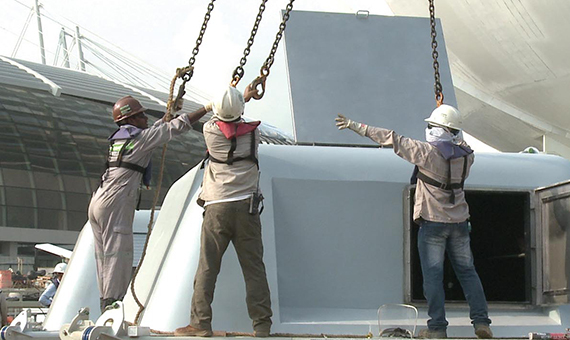 Nine high powered High Definition Video Projectors enclosed within customised floating barges. Water~Screen vessels and projection barges designed for use in natural waterways are 100% floating, so they can rise and fall with variations in the water level, whilst remaining perfectly aligned. The original sound score, recorded by the 140 piece Bratislava Symphony Orchestra is enjoyed through 7.1 surround sound generating over 50,000 watts of sound reinforcement including 20 high-level concert Line-Array Speakers, 16 x 450cm sub-woofers driven by 32 amplifiers. The entire soundtrack is transmitted to the wider bay area via FM frequency, so surrounding audiences can tune into the action on 103.9FM. A plethora of special FX including fog, strobe lights, bubble machines and environmentally friendly fire effects. As part of the complex creative programming process, flight paths were analysed in conjunction with the Singapore Civil Defence Force (SCDF) and Civil Aviation Authority of Singapore (CAAS) to ensure pilots did not encounter misdirected lights or lasers. The entire show can be operated by iPhone or iPad from anywhere in the world. ‘Wonder Full’ features new and exciting technology that took Laservision three years to develop and refine. Laservision has incorporated extremely energy efficient lighting technologies into the design such as intelligent LEDs, which aside from reduced energy consumption benefits, also have a longer lifespan; therefore reducing landfill waste and emissions created in the process of replacing consumables. Laservision’s Water~Screen systems use a patented air-to-water mix ratio that aerates the surrounding body of water. Aeration promotes fish abundance and diversity, breaks down waste, neutralises excess nutrients that are the result of metropolitan run-off and reduces the level of gases such as carbon dioxide and hydrogen sulphide. 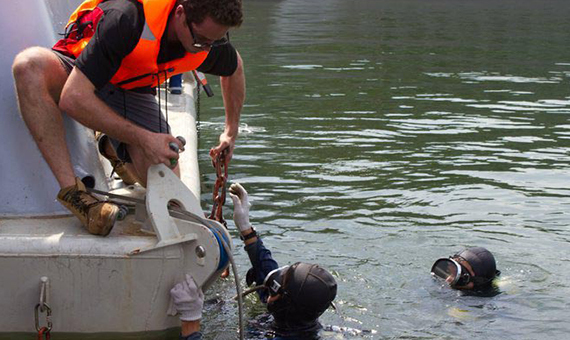 As Marina Bay has become a water reservoir, the Water~Screen systems have improved the quality of the drinking water. Laservision’s latest solid-state optically pumped laser systems are now a staggering 2,000 times more energy efficient than traditional technologies making them the most efficient technology on the market today – all courtesy of Laservision’s Australian Government Research and Development facility. As the attraction relies on a range of cutting edge and sophisticated technologies, Laservision felt it was not necessary to incorporate an arsenal of pyrotechnics to provide the ‘Wow factor!’ Attractions that fire off pyrotechnics on a nightly basis release tonnes of toxic gases and chemicals into the atmosphere and surrounding waterways. 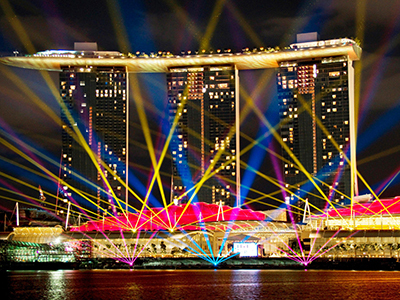 As this attraction is located on Marina Bay, which is a drinking reservoir, the nightly spectacular is free of any falling debris that could comprise the quality of the water. On special occasions that call for extra celebration such as Chinese New Year and National Day, zero fallout pyrotechnic technologies are used to minimise the environmental impact whilst still maintaining a premium effect. Since inception in February 2011, ‘Wonder Full’ has attracted an estimated 4.2 million visitors from around the globe. The show is popular with both locals and visitors and continues to play to over 30,000 spectators per week, driving a huge footfall to the Marina Bay Sands estate and bayfront area. 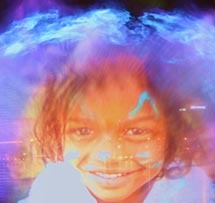 The show has received international acclamation, including ‘Best New South East Asian Tourist Attraction’ by ASEANTA (Association of Southeast Asian Nations Tourist Association), Winner of PATA Gold Award for ‘Contribution to Culture’ (Pacific Asia Travel Association) and ‘Best International Multimedia Show’ by ILDA (International Laser Display Association). 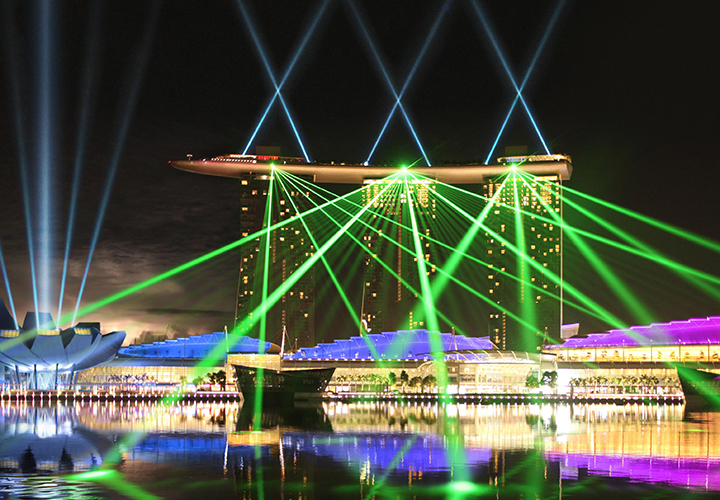 To maintain the integrity and quality of ‘Wonder Full’ the Marina Bay Sands Corporation engaged Laservision to provide a comprehensive operation and preventative maintenance program. Laservision Singapore branch office provides a dedicated support team of technicians who are devoted to ensuring the experience continues in its full glory.